On April 19, 1943, Jews forced to live in the Warsaw Ghetto began an uprising against Nazi forces occupying Poland at the time. 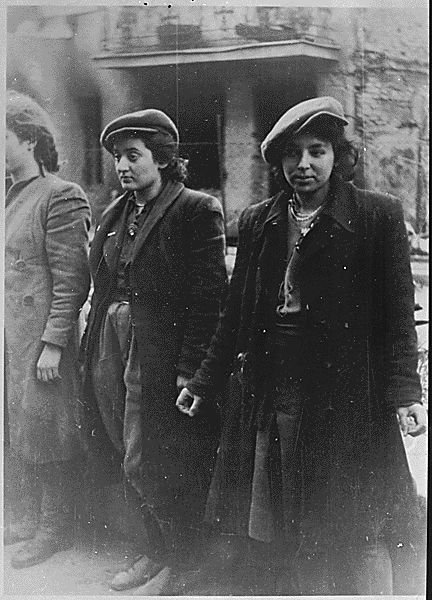 Nazis captured many rebels, including these women, who contributed to the doomed Warsaw Ghetto Uprising. Most survivors were deported to concentration or execution camps. On April 19, 1943, Jews forced to live in the Warsaw Ghetto began an uprising against Nazi forces occupying Poland at the time. In July 1942, Nazis began shipping thousands of Jews from Warsaw to the Treblinka extermination camp, about 100 kilometers (62 miles) away. Between July and September 1942, more than 265,000 Jews were deported. As the deportations continued, Warsaw Jews formed a resistance movement, the Jewish Fighting (or Combat) Organization (ZOB). This group worked with other resistance movements (such as the Jewish Military Union) to hide and protect Jews from deportation as well as sabotage Nazis and other occupying forces. In the morning of April 19 (the first day of Passover), the Nazis attempted to clear out the ghetto. Members of the ZOB met them with resistance. About 1,500 Jews opened fire on the Nazis, destroying tanks, killing soldiers and preventing reinforcements from entering the ghetto. The Nazis had planned to liquidate the ghetto, but the Jews held them off for almost a month, until they ran out of ammunition. Most survivors were captured and deported to Treblinka and other extermination and concentration camps in Poland. low-income urban neighborhood populated by members of a minority group. supplies or personnel provided as support.